Take a tour of the World Heritage Site of Sanchi Stupa and historic city of Bhopal from Ujjain in a comprehensive 2-Day tour. Take a tour of the World Heritage Site of Sanchi Stupa, commissioned by Ashoka in the 2nd-Century BC. Explore one of the greenest cities of India, Bhopal. A hassle-free journey from Ujjain to Sanchi Stupa via Bhopal on a well-maintained car. The 11th-century city of Bhopal offers up incredible views of parks and lakes and have long been favourite destinations for artists and musicians. People with a passion in history will love to explore this place. The markets are vibrant and offer exclusive quality shopping at Bhopal. The cuisines of Bhopal is like north India but still distinct. On the whole, each place in Bhopal gives you different food, lifestyle, and experience as a traveller. Sanchi Stupa is a Buddhist monument, located about 50 km from Bhopal and is a UNESCO World Heritage Site. The stupas were built around 3rd century by king Ashoka, a renowned follower of Buddhism. Stupas are large hemispherical domes, in which Buddha's relics were kept in their central chamber. One of the best-preserved stupas in India is the Sanchi Stupa. It is surrounded by a railing with four carved gateways facing all the four directions. The driver will pick you from hotel/residence address in Ujjain city limits at a time selected while booking. Post-pick-up you will be driven from Ujjain to Bhopal, your journey will be of 3 and a half hours, we suggest you leave early from Ujjain. Shaukat Mahal- is one of the architectural curiosities of Bhopal and is a mixture of Indo-Islamic and European styles of architecture. Upper Lake - also known as Bhojtal and is the main source of drinking water for the residents. State Museum Bhopal - showcasing archaeological finds from different districts. Birla Temple - is situated at the highest point in Bhopal and is dedicated to goddess Lakshmi. Post your Bhopal tour, you will be dropped to your hotel in Bhopal city limits. On the second leg of your tour, you will be picked up from your hotel in Bhopal, post which you will be driven to Sanchi Stupa. The drive to Sanchi Stupa is about 50 kilometres from Bhopal and it may take up to 1.5 hours to reach Sanchi. You will have ample time to explore this ancient stupa and explore the place at a leisurely pace. After you are done with your tour of this enchanting place, you will be driven back to Ujjain and be dropped at your hotel/residence. All transportation using Air-Conditioned cab. Pickup and drop-off in Ujjain city limits. 520 kilometres of usage (can be extended with extra charges). Itinerary mentioned is a suggestion, you can add/skip places. Any Toll and Parking fees (To be paid on actual). Night charge of Rs. 250 applicable if used beyond 10:00 pm. The booking price is applicable if the pick-up and drop-off is the same location. Pick up and drop off location can be different but an extra charge will apply. To be paid to the driver directly. The tour has a limit of 520 kilometres. After 520 kilometres, additional per kilometre charge will be applicable (to be paid directly to the driver). For Sedan (4-seater) - Rs. 11 per km (additional kilometre). For SUV (6-seater) - Rs. 13 per km (additional kilometre). For Innova (6-seater) - Rs. 15 per km (additional kilometre). 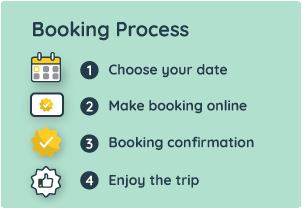 The driver will know the local language, English speaking driver can be requested by you during the booking in "Special Request" section, the team will try their best to fulfil the request but the same cannot be promised for sure. The driver will pick you up directly from your hotel or specified pick-up point in city limits. Please enter the full pick up address at the checkout page. The contact person details and phone number are shared in booking voucher sent to you via email after booking. The driver and cab details are share 2 to 4 hours prior to the tour starting time.